Rosewood London Hotel, London is situated in one of the capital city’s most historic locations and it has an equally fascinating past. High Holborn was originally a Roman road and following the Middle Ages, the area became established as a centre for the legal profession and the city’s most influential and powerful people. This is where, for example, the writer Charles Dickens wrote “Oliver Twist” and “Great Expectations” and many scenes in his novels were set in this historic part of London. The hotel’s 400 sq. m. (4,305 sq. 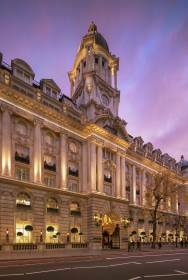 ft.) Grand Ballroom and historic surroundings make it an excellent London conference and events venue. The 22 meeting rooms and 1,065 sq. m. (11,464 sq. ft.) of total meeting space can be flexibly arranged for conferences and business purposes, or special events such as weddings, birthdays, anniversaries and other important social occasions for groups of five to nearly 500.